Improvising in the kitchen by putting a well stocked liquor cabinet to good use. The beauty of working in a restaurant is that I get my days off during the week and I have time to cook instead of foraging in the refrigerator and cabinets. Don’t get me wrong, I still dig around and make things from what I have. The difference is that on Tuesdays and Wednesdays, my dinner won’t be between two pieces of bread. I stared into the depths of drawers, cupboards and shelves last Wednesday trying to figure out what to do with one steak — it had to feed two people. With not enough vegetables for a stir fry and not enough anything for fajitas, I pulled the single NY strip from the shelf and looked back and forth from it to the smattering of possible partners. “Do we have any potatoes?” I asked my brother without looking up from the refrigerator. “Did you look in the drawer?” he yelled from the couch. Sure enough, they were there and along with a sad-looking bag of carrots, I hatched a plan. I’d had a staff meal of shepherd’s pie at work a few weeks before and — while I’m not really keen on lamb — the delivery was genius. The sweet, rich meat, roasted vegetables and gravy all stuck to the whipped mashed potatoes making every bite the perfect bite. I grabbed the potatoes, peeled and cubed them and put them on the stove to start the mash. With a bag of frozen peas, it was a meal that really began coming together. But what to do about a sauce? The chef at work used Guinness but we didn’t have any. The beer — with its roasted malt, coffee and bitter chocolate flavor — was the center of the dish. A stout was what I needed. A Brooklyn Brewery Black Chocolate Stout was what I had. “Hey, Matt–do you think I could use this Chocolate Stout for this?” I asked. Satisfied with the plan, I sliced and browned the meat with some onion and garlic, added in the beer and waited. I leaned in to see if what I was doing was working and my whole face was filled with the sweet swirls of singeing beef, earthy chocolate, and garlic. 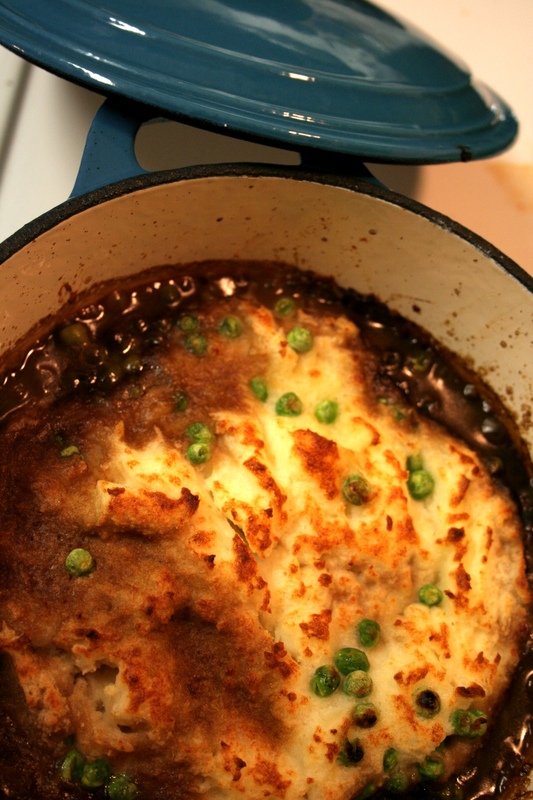 With meat braising (read: to cook by browning in fat and then slowly cooking in a covered pan with a some liquid), I mashed the potatoes with butter and cream and layered the ingredients in a casserole dish — meat, carrots, peas and potatoes — covered and put in the oven. I pulled the lid off for the final few minutes to get a good crust on the potatoes and to make it look as I’d seen in the weeks before at work. We dove in to find the meat dissolving to the lightest bite, full of the deep, woody, bittersweet chocolate of the beer. The creamy mashed potatoes held onto the gravy for dear life; the carrots and peas little life boats of respite from the richness. Matt looked at me in disbelief. You just made this up? You can make stuff up any time you want to, ok? Peel and cube potatoes. Place in 4 qt. stock pot with enough water to cover them and boil until potato is tender to fork — about 20 mins. While potatoes are cooking, dice carrots and onions and set aside. 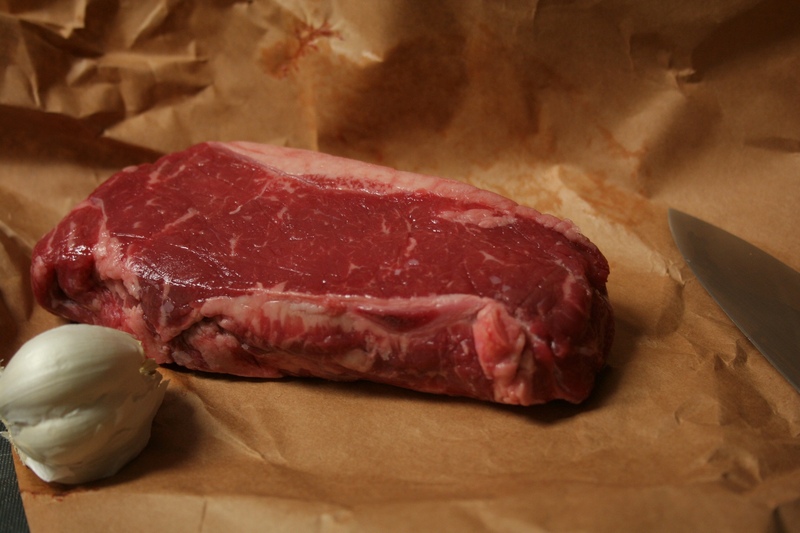 Remove large portions of fat from outside of NY Strip. Slice steak into 1/4″ strips. 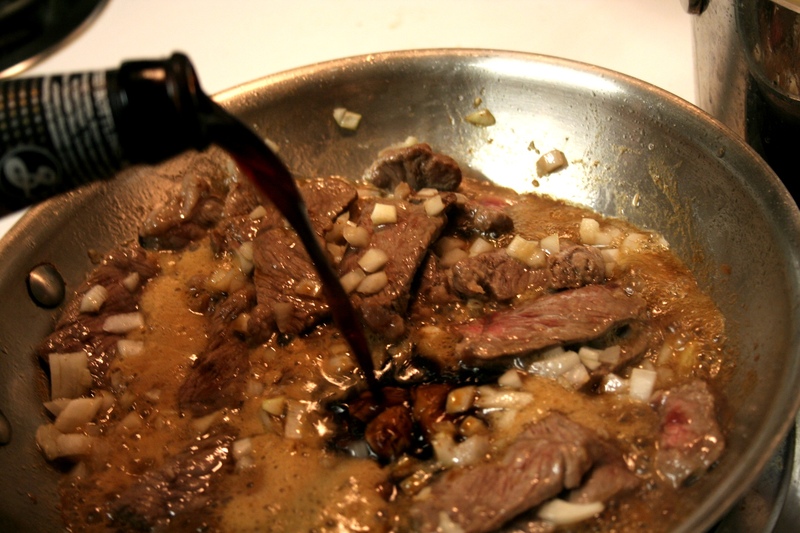 In a frying pan, heat olive oil and garlic on high, stirring to ensure garlic does not burn. 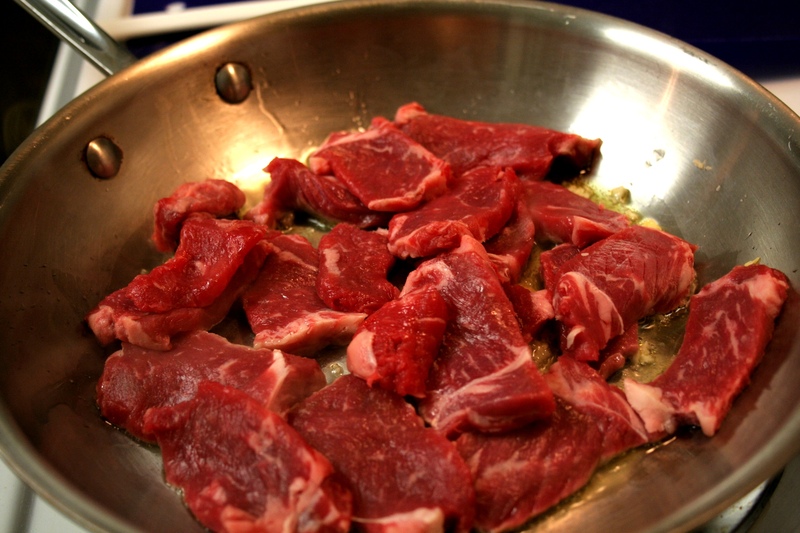 Add meat — cooking until lightly browned. Add onion and 1/2 bottle of beer. Cover, cook on low until potatoes are ready. When potatoes break easily when pierced with a fork, remove from heat and drain. Return potatoes to stock pot and mash until no lumps are visible. Add butter and cream. Beat with electric mixer until smooth. In casserole dish, layer meat, carrots, peas, the rest of the beer and the potatoes. Cover and cook for 25 minutes. Remove lid and broil for 5 minutes. Remove and serve immediately. *The only sad thing about this dish is that Brooklyn Black Chocolate Stout is only released in the winter — it’s a bit heavy for the summertime. BUT so is this dish…enjoy! The high heat, full mouth fire that burns into my nose and smoulders in my belly warms me to the core and fills me right up. It’s also a meal that requires one pot and very little attention. So, what’s not to love? 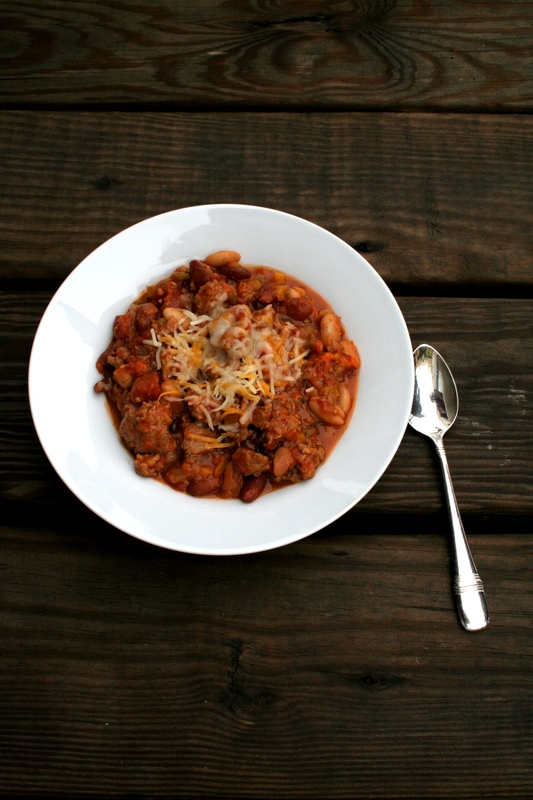 The difficult thing with chili is to narrow down exactly what I put in it — it’s a gut-feel kind of meal. Sometimes, I only put one type of kidney bean or only a green pepper instead of an assortment of colors. I have, on occasion, completely forgotten onions. Sometimes, my guts are feeling risky and I add a few more chili peppers. When I first asked my mom how to make her chili, she rattled off the ingredients and instructions. Meat, onion, chili powder, kidney beans, tomato paste. I was shocked. She used McCormicks Chili Powder. No actual peppers were invited to her pot. Finally, I knew then why toed the line of being a spicy Hamburger Helper with beans. I’d head chili that made me sweat and my stomach burn for days. That’s what I was looking for. So, I took the basics from her recipe to create my own. My chilis of choice: Guajillo, Chili de Arbol and Chipotle peppers, respectively. The guajillo peppers add a very light touch of sweetness but have a slap-in-the-face of heat once swallowed. Chili de arbol provide more spice up front that fill the entire mouth, give that tongue tingle and burn up into your nose and eyes (in a good way). And the Chipotles — well they just give the whole thing a greatsmoke. The chipotle pepper is really just a smoke dried jalapeno, but the smokiness is bolder than any hotness of the pepper. If you don’t like it really hot, you can split the peppers and remove some or all of the seeds. Taking them out of the pot after a few minutes also helps if you don’t want to sweat. My gut also tell me that whatever I’m drinking, the chili pot should, too. My favorite addition to a chili pot is a IPA (Dogfish Head 60 Min to be exact) for it’s slight bitterness and lemony notes that slice up some of the spice and pull at the zip from the bell peppers. I start with ground turkey meat — some fat here is needed, so a 93% lean is what you want — a big stock pot and some olive oil. Once it starts to brown up a bit, in goes about half a bottle of beer, the chilis, and some cayenne powder for good measure. I let them sweat for a bit while I chop (and open) up everything else. A few different types of bell pepper, some onion, kidney beans, diced tomatoes and voila! Now here’s the only hard part: not diving in right away. The chilis need a while to release all of their oils and get the spice to cook into everything. I add the rest of the beer, cover and drop the heat to low to cook for about an hour until it looks more like it should…might not be so pretty, but its sure to get folks hot and bothered. In a large stock pot, heat olive oil. Add ground turkey. 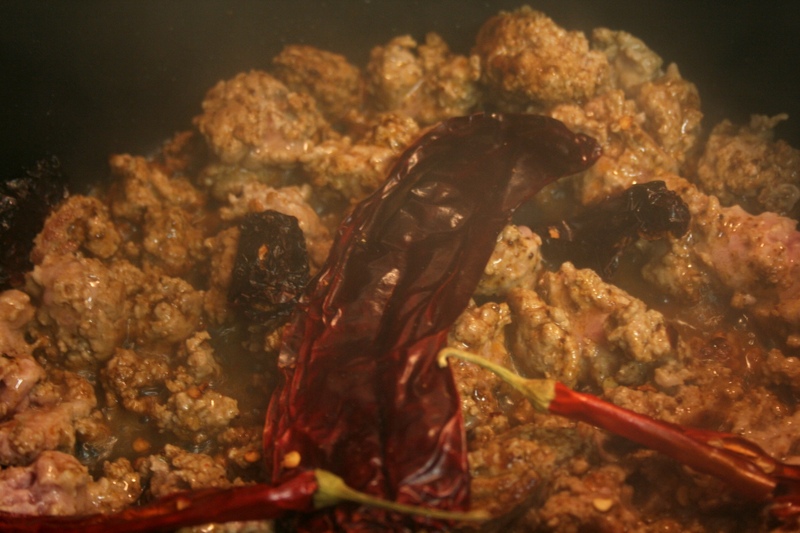 Once almost all meat is browned, add chili peppers, cayenne powder and 1/2 of the beer. Simmer 15 minutes. Add diced onion, bell peppers, kidney beans, cannellini beans (with liquid from can), diced tomatoes and the rest of the beer. Cover and simmer 45-60 minutes or until desired thickness is achieved. Top with cheese and serve. With 80 degree days in the middle of March this year, my itch for bare feet and beers in the sunshine is strong — and the bizarre flip back to normal chilly, rainy spring days has me looking for summer anywhere I can find it. Wearing flip flops on days when my toes turn blue is not working out so well though. So I started looking for summer at the market. Reading Terminal Market is my go to for great meats, fish and vegetables — and I get a student discount on Wednesdays to boot. I like to go in the morning, after the 9-5’ers rush in and out for breakfast — it’s quiet, everyone is still happy since their days’ haven’t had much chance to be bad yet, and navigating the stalls is managable. Forget about going at lunch time. Glorious piles of shrimp. I was raised on this stuff. Pink foods were my thing for a while — shrimp and salmon were all I wanted. When picking my poison, I asked why some were pink and others blue. The answer: different species–but they all will turn pink when cooked. I’ve worked with both before and find that it’s easier to tell when the tiger shrimp (read: blue shrimp) are cooked because they turn pink…so I ordered a pound and headed home. With the shrimp split up the back and cleaned, and Corona in hand — because I deserve a beer after that process — I readied my double boiler and jumped up on the counter in search of some Old Bay. I spotted red lid, caked with remains of crab boils past and muscle memory took over; the salty, peppery chili spice watered on my tongue. I grabbed the can and jumped down, excited that in a few minutes I would be feasting…but something was off — the can was too light. The Old Bay was gone. Why else would it be in the back of the cabinet? This is what living with your little brother is like. I had to try something else. So I dumped the remains of my beer into the bottom pot of the steamer in place of the water, squeezed the juice of half a lime and crossed my fingers. Like shrimp, Corona and lime make me think of summer time.This might just work, I thought to my self as I placed the top pot with the shrimp over the beer and set my timer for 8 minutes. And work it did. The green, citrus cut the fishiness and gave most of the flavor (kind of like it does with the beer) but grain and corn flavors from the pale lager just made it to the meat. My intention was to put these shrimp onto a salad, take a new beer out to the back deck and listen to the hum of I-95 — which, if you close your eyes can be confused with the sounds of the ocean — but I never made it. My brother came home and we ate them all out of the pot, right off of the stovetop. Just like we used to in the summer when we were kids. If you are able to get cleaned and de-veined shrimp, do it! Otherwise, cut the shrimp along the back with a paring knife or pair of kitchen scissors and clean the black vein out. 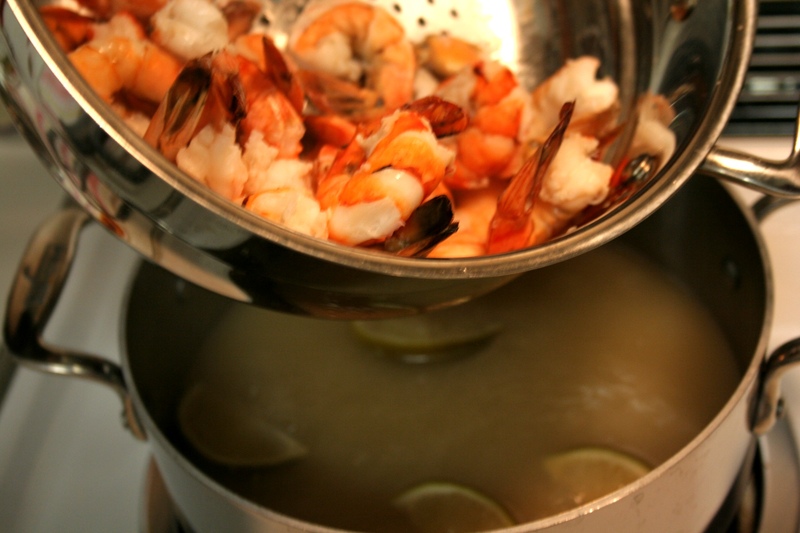 In the top/steamer pot of a double boiler, rinse all of the shrimp well. 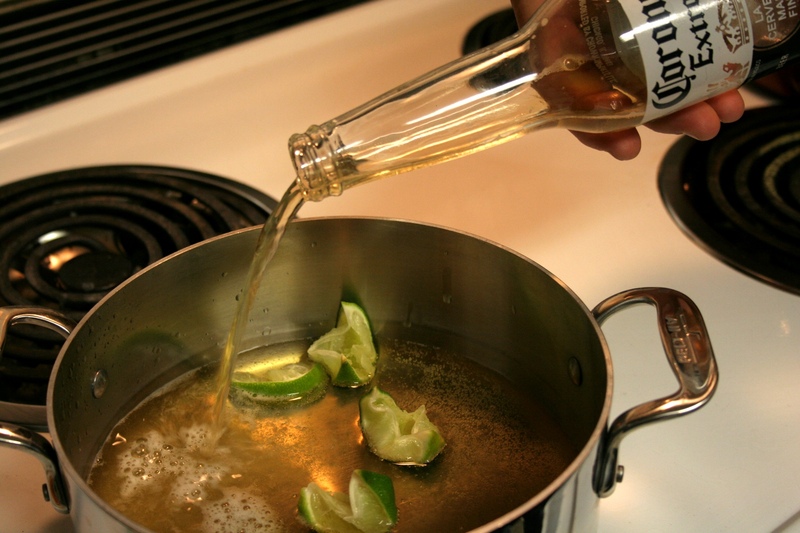 In the bottom/sauce pot, pour the beer and juice of 1/2 of a lime. Stack pots, cover and cook on med-high heat for 8 minutes. Shrimp will be completely pink when they are finished. Remove from heat and serve, squeezing extra lime to taste. If you have a love for spirits and a love for food, you're in the right place...come 'on in. Spill the Sauce is inspired by my constant need to improvise in the kitchen…my near constant need for a cocktail…and a love for all things palatable.